I know, I reeled you in with that title. And guess what? Nothing really happened this weekend. I did teach a yoga class Saturday morning and it was really fun. I did hate having to miss all of the Yoga Day USA buzz because I was teaching though. 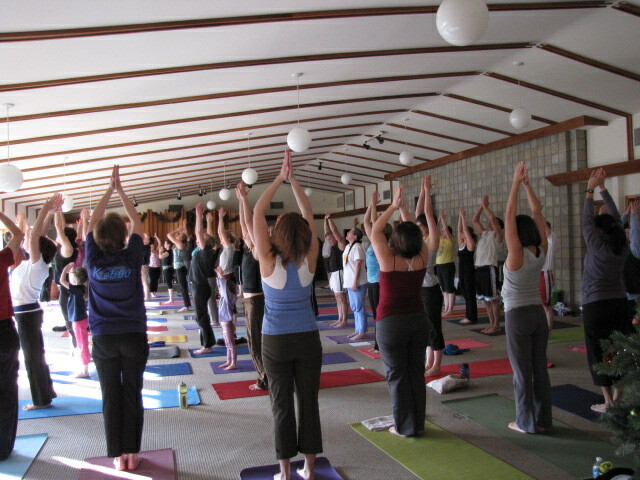 Word is the Meyer Center had 80 people for the Yoga Flow. That is fantastic! Meanwhile, Beth had 30 or so at her center, doing yoga, chanting and enjoying Eric on the drums as well. Would’ve loved to have been there too! I think any money they took in went to Haiti so that was totally awesome. This morning was Sunday and I attended Beth’s class. We did a Yin practice which I really enjoy, and hadn’t done in awhile. Her studio is starting to feel really cozy with the hot tea, the bookshelves and the gong. It’s all that. I love it! In a Yin practice, you hold a pose passively for a long time. Long as in like two to five minutes. Lots of people have a problem with this as in they get fidgety and can’t stand it. Not me. I can be there and then some. I left there feeling quite good today even though I was super tired from some drama the evening before. Nothing like a good yoga class to wake you up all over and make you realize there’s no need to sweat the small stuff. At noon today my good friend picked me up and we went to see Up In The Air. Go see it. I didn’t even know what it was about. Only the fact that George Clooney spent a lot of time at airports. I am so glad we saw that instead of It’s Complicated, which was her first choice. It’s always good to check Rotten Tomatoes out before you head to the theater. I’m still swimming. I haven’t given up. This last week I went twice at lunchtime. This next week I cannot do that anymore as I’ll be teaching yoga every day at noon, so I’ll swim in the evening with the men. I shall not complain. I have to swim 72 laps to make a mile, or 36 laps back and forth. I usually count by twos. So, after swimming about 20 minutes, I usually hit 40 or more with ease. I’ve been swimming for 35 or 40 minutes every time, so I’m thinking, I’m hitting close to two miles. That doesn’t seem possible. I’d better ask the lifeguard again to make sure that the count is right. The other day, I met a fellow yogini in the lane next to me. She was a pretty tight swimmer. She asked me if she could give me some advice. I said of course. She’d noticed I’d only been breathing to the right and she was correct. I hate breathing on the left, I get a mouthful of water, it’s unnatural and I don’t like it. I told her that I knew that and my neck was going to pay for it. And someday my right side would look like I’d been injecting steroids on that side only. She had a good point and that was balance. She mentioned to me that I wouldn’t just do triangle on the right side would I? Of course not. I swam on Thursday and turned my head to the left several times. Still can’t figure out why going to the right is so smooth. I guess we go with what feels right or what we know. I shall step out of this comfort zone more often. Of course, I’ll be choking and spluttering away, but hey, there’s nothing like a good mouthful of chlorine now is there? I’ll have to think of that as my germ killing breath to the left. This week I start back with the yoga at MSU. I’ve got 4-days with them in a row at lunchtime and I’m excited. And I’ve got a decent crowd, which in turn means a decent paycheck at the end of the session. Volvo fund, every penny I can spare. My daugher is turning 12 on Thursday. It does not seem possible. Can I really be that old? Categories: Yoga | Tags: day, swimming, usa, Yoga | Permalink. I’ve decided that I weigh too much, or maybe I’m just too short. Yeah. That’s it, I’m too short. I love the warmer weather when I can ride my bike to work and get exercise in that way. I do see lots of people riding bikes in this kind of weather, but I just can’t get into it. Maybe that’s because I’ve never tried it, who knows. I saw someone ride by when it was close to zero. They were so bundled, I don’t know how they could ride. His head was totally wrapped with a scarf, then covered by a ski mask. Then he had a motorcycle helmet (complete with shield) over that. I’m thinking that person didn’t have a choice. I also love to walk in nature when the weather is good, or not so good. I’ve been known to head to the nature center when it’s going to storm. So far I haven’t been struck by lightning with my car keys in hand. I work at the YMCA so I can go there for free. But do I? Nope. Why? I have no idea. I think sometimes when you work someplace, you just want to leave there when you’re finished. I love the water. I love to swim and years ago, before I had children and I owned my own business, I would drive all they way across town to swim at the Y at six in the morning. It was kind of intimidating. Why you ask? Because it was a bunch of athletic business guys and me. I’d been reflecting on that time way back when during that one winter where I swam away and I really enjoyed it. The quest was on. I had to get a one piece bathing suit because my flaw hiding, designer suits just weren’t going to cut it for lap swimming. I don’t think anyone I know likes to go swimsuit shopping, especially in the wintertime. Since we live where we do bathing suits aren’t readily available this time of year. So I did what any computer geek would do. I ordered three, online. I scored as one fit. I scored again because when I peeled it off (and was thinking that the pattern was too busy for me) I found out it reversed to black on the other side. Awesome. Black is good, especially when you only sport six inches from your navel to your pelvis. Next up I had to find a pair of swim goggles. MC Sports usually has this sort of thing. Not this time of year. They had plenty of flippers and masks but no Speedo goggles. I was bummed, thinking this was yet another item I would have to order online. Then I remembered Bass Pro! Heck it’s right up the road from where we live. They had a ton of Speedo goggles. And they had the junior size for people with smaller heads like myself. I was ready to swim. Our Y offers lap swimming early in the morning, during the lunch hour and right after work from five to six. I didn’t feel like doing early morning again. I wanted to do the lunch hour, it’s less crowded, but I will be teaching every single day at lunch with the exception of Friday. No complaints there. So the five to six time it would be. I headed out on Monday night and got there ten minutes early. People (men) were already swimming, so I chose a lane that was not roped off and hugged the wall. I didn’t feel like getting trampled. It had been a long time since I’d swam like this. Would I last longer than five minutes? Yes, yes I would. I swam laps for thirty-five minutes with a few short breaks. I did what most people do when they start out. I swam too fast. I was excited. The water felt good and I was really happy to be there. Even if it was just me, and a bunch of other guys, I got over it. I’ll be going back and who knows, maybe I’ll continue through the nice weather. Feeling stuck in your exercise routine? Try something new or return to something you once loved. I think that’s the key. Categories: Projects | Tags: exercise, lap, laps, swim, swimming, YMCA | Permalink. The holidaze were busy, but quiet around here if that makes any sense. We had sporadic internet service. Our phone was fixed on the 28th. It turns out the technician crimped a wire when he slammed our phone box shut. It’s all good now. I’m even doing the yoga community e-newsletter as I blog away. Let’s hope the internet holds up. Seems to go down in the middle of the night. So I was thinking about not sleeping tonight, just to see if I can catch those gnomes that are gnawing away at our wires. We didn’t have any company for the holidays. But we did have lots of fun. I saw Avatar in 3-D. We got Chinese food. We cooked, we snacked, we baked. It was all good. 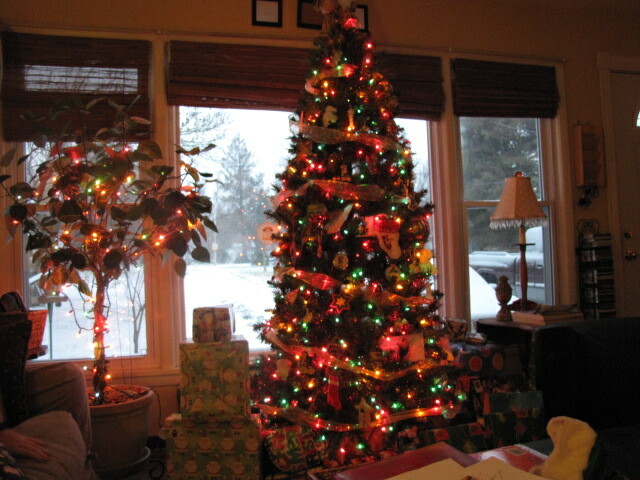 I know this isn’t very festive, but Christmas Eve day started out like this. 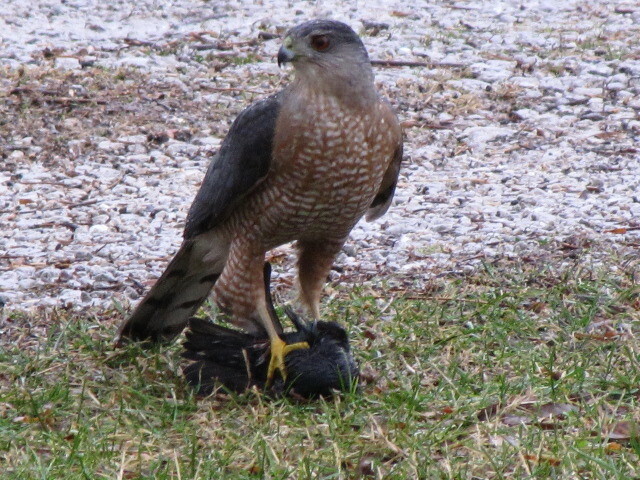 What a beautiful bird and in the front yard none the less. The omen, who brought us bad phone luck! 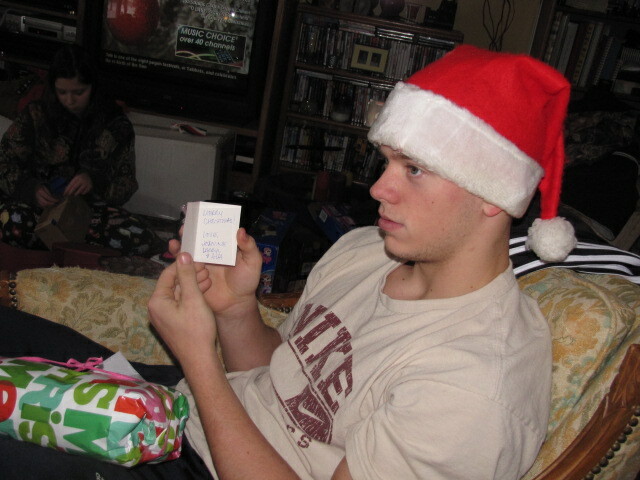 Then we opened presents Christmas morning. We even had a dusting of snow. 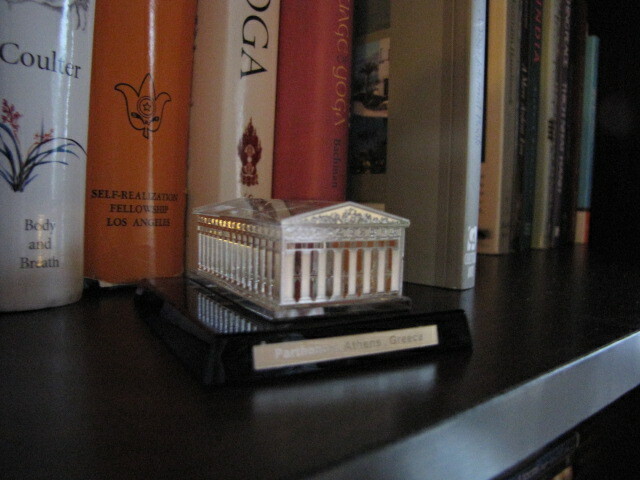 I’ve always wanted to go to Greece, so Frank got me a mini version of the Parthenon. It’s all crystal and mirrors, pretty smokin’. 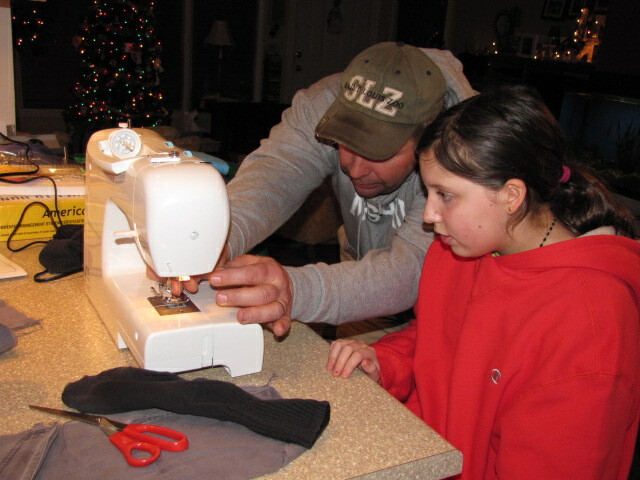 Lauren got a sewing machine. Good thing Frank was home to help her figure it out. I can sew by hand, but machines are over my head. They had a great time together. He totally looks like a seamstress doesn’t he? I cracked up. They sewed stuff all night long. Frank even patched his socks. Jordan got an aluminum water bottle from my sister. Track practice ya know and let’s be gentle on the earth. I spent New Year’s Day at the UU Church doing 108 sun salutes, taking photos and shooting video. Annual Yoga Mala. We had a turn out of around 80 and raised $714 for the Ozarks Food Harvest. Good time was had by all. Then we got snow for the new year. 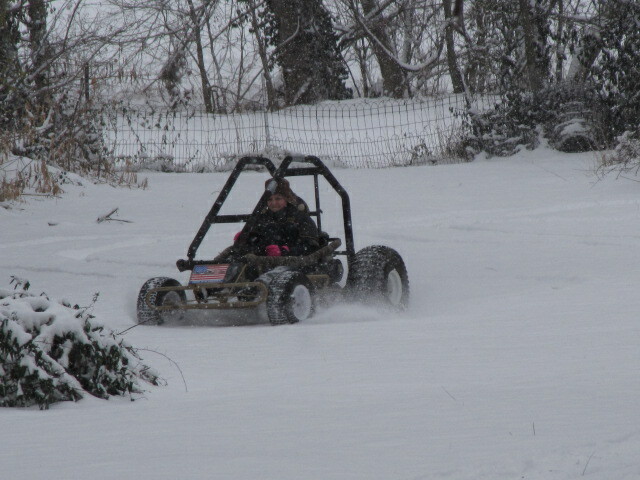 Check out Lauren on the go-kart out back. What fun she had. 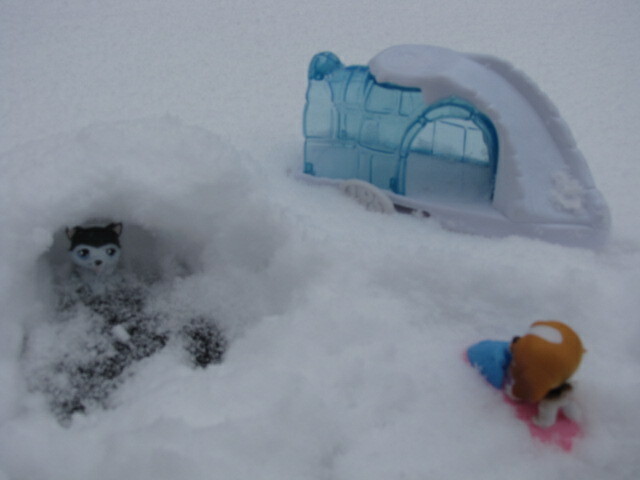 And of course, the Littlest Pet Shops went out on the trampoline in true winter style. 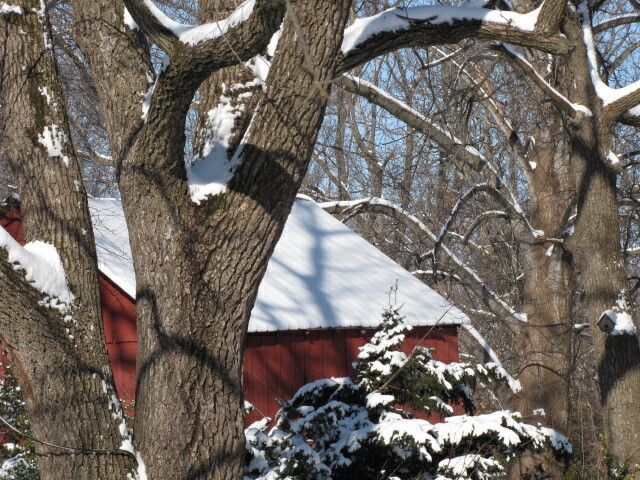 Enjoy the beauty but stay warm. The thermostat says something like nothing right now. As in ZERO. Categories: family, Yoga | Tags: 108, charity, chicken, go, hawk, kart, littles, mala, pet, salutes, shops, snow, sun, Yoga | Permalink.